An indescribable enchantment informs his work. Claude Lorraine, a pure soul, hears in nature the voice of consolation. He repeats its words. To those who immerse themselves in his pictures -their consummate artistry and finish make this a great pleasure indeed - no further word is needed. The Pope, the Spanish King, cardinals and Roman nobles showered him with commissions. Louis XIV of France, the first notable collector of his work, greatly admired the painter Claude Gellee, who took the name of his birthplace, Lorrain, as his surname. When he was twelve or thirteen, he moved to Rome, where he spent the rest of his life, with the exception of two years in France. In Italy-he was caught up in the enthusiasm for antiquity and the Middle Ages. Claude Lorrain loved painting fantastic landscapes filled with temples, palaces, ruins and magnificent trees of his own invention. He not only worked over his compositions, he staged the scenes. His handling of light was what made him unique; indeed, Lorrain is famous for being the first painter to exploit overtly the manifold possibilities offered by the play of light and atmospheric effects. His paintings of seaport scenes with the sun reflecting off the surface of the water have earned him his reputation as a master of landscape painting. The Romantic philosopher Carl Gustav Carus raved about Lorrain's "mild wafting of southern breezes" with all their "clarity inspiring sensibility". Johann Wolfgang von Goethe owned twenty-seven Lorrain etchings. In his Italian Journey, Goethe feels at a loss for words to express his debt to Lorrain: "There are no words to describe the clear haze hovering over the coasts when we used to go towards Palermo on the most lovely afternoons; the purity of contour, the softness of the whole, the subtle gradation of tones, the harmony of sky, sea and land. He who has seen it possesses it for a lifetime. 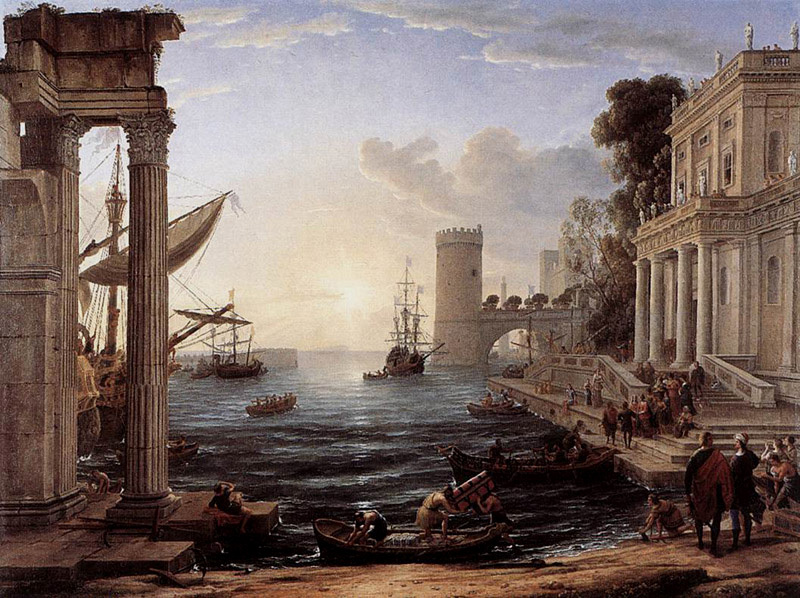 Now I begin to appreciate Claude Lorrain." Lorrain had always focused on landscape. However, he used his shady foregrounds as settings for mythological and biblical scenes, such as Seaport with the Embarkation of the Queen of Sheba. There are no literary references to the event. The Old Testament merely describes the legendary queen's stay in Jerusalem, where she visited King Solomon in the tenth century ВС to ascertain whether his wisdom was all it was reputed to be. The subject-matter of the painting, which was commissioned by a nephew of Pope Innocent X in 1648, the last year of the Thirty Years' War, is purely a product of the artist's own poetic imagination. Yet, Lorrain was not the only artist enthralled by the Queen of Sheba. In his play entitled The Sibyl of the Orient or The Great Queen of Sheba, the Spanish playwright Calderon de la Barca writes: "Where the sun's first cradle stands, where the light begins the travail of his daily journey, there lies a fertile, rich land like a thousand gardens of narcissi. This place, which glows so delightfully in the young beams of day, is ruled by the Queen of Sheba."